Eminently predictable. Forget about escrow and the Olympics. This changing salary landscape is the flashpoint for the next CBA negotiation (and likely lockout). That’s why every NHL General Manager was likely going nuts about Willie Nylander, urging the Leafs to “hang tough”, and spreading the false narrative that the player had “no leverage” (for a guy with “zero leverage”, young William did surprisingly well, and Kyle is no dummie). Nylander’s new contract represents just the first hole in the dike. The leak that he created will turn into a flood of dollars next off-season when you see the names of RFAs due for a new contract at that time. Here’s another totem which is likely to be exploded soon: The notion that wingers should only look at salary comparables with other wingers to determine their contract value. 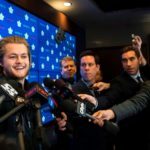 For Nylander, went the argument, the comparables were players like David Pastrnak or Leon Draisaitl and those players effectively framed the underlying salary negotiations with Toronto. But why shouldn’t guys like Mitch Marner or Mikko Rantanen be looking at someone like Jack Eichel as their comparable? So what if they don’t play centre? If they are producing points at a rate comparable to Eichel, isn’t that all that matters? And what if they are the best players on their team, (as might well be the case for Rantanen or Matthew Tkachuk)? Shouldn’t that be the main consideration that determines their contract value? As Masisak pointed out, the NHL is being forced to transition to this new reality very quickly, and many teams face years of painful adjustments, as expensive veterans get worked off their books. That includes former league powerhouses such as Chicago or Los Angeles and probably San Jose as well. In fact that many franchises are likely to be adversely impacted imminently. Sadly, if the history of the NHL is anything to go by, this suggests that we could have more labour trouble brewing soon. And, contrary to what was earlier believed, it might well be the owners, not the players, who re-open the current collective bargaining agreement (CBA), as they balk at the salary demands of these younger players. The ultimate solution is likely a move toward an NBA style system: 5 year entry level contracts and then an immediate move to UFA status. Perhaps the NHL will also take another page out of the NBA playbook by limiting contract terms to 5 years (maybe 5 for the team that owns the rights to the player and 4 years to anybody else). But limiting term any further will also accelerate changes in the salary landscape and ensure that even more dollars go to the league’s stars (as it does in the NBA). The end result: a bell-shaped curve, in which salaries will be limited in the first five years, explode between 25-30, and then drop precipitously as players move into their 30s. Not only will we see players in their mid-20s maximizing their earnings by, say, age 26, but players in their 30s will largely be playing for close to league minimum, assuming they play at all. One thing is certain: players in their 30s will NOT be making $6m plus like Patrick Marleau is today. Here’s another thing to consider: a player like Erik Karlsson (who is caught in the middle of this transition) might find that he doesn’t get Drew Doughty type money next season or, at the very least, Drew Doughty type TERM. Who wants to be paying $11m a year to a player in his late 30s? Who will be able to afford to do so? Further down the road, players like Nazem Kadri might find that the window to maximise their earnings has already passed them by when they get to their next contract negotiation (when a player like Naz will be in his 30s). He may find that his next contract doesn’t give him a big bump up; the opposite, in fact, might be true, assuming Kadri stays in Toronto. 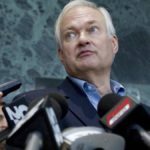 I think Kyle Dubas recognizes this, which is why he is not listening to “experts’ like Brian Burke, who told him to hold the line and who now loudly proclaims that the Leafs are in “cap hell” (Dubas’s disinclination to adhere to traditional hockey thinking also explains why Brendan Shanahan tagged him as the most capable man to run the Leafs over the next few years). So does the NY Rangers’ GM, Jeff Gorton. His NY Islanders’ counterpart, Lou Lamoriello does not, or else he wouldn’t have paid such absurd amounts of money to the Leafs’ recently discarded Leo Komarov. Which is why the new Seattle franchise might do well to consider one of the new breeds of General Managers to run their clubs, rather than an old school “solid hockey man”. Steve Yzerman, anybody? Or perhaps Toronto’s assistant GM, Laurence Gilman, who at the centre of this disruptive transition today? Without a doubt, Toronto will sign both Marner and Matthews this off-season, and if that means about 48% of their cap is devoted to 4 players, so be it. Gardiner will likely be gone, a few more Marlies (eg Jeremy Bracco or Carl Grundstrom) will be brought up to be plugged in as the Leafs get close to the cap limits.